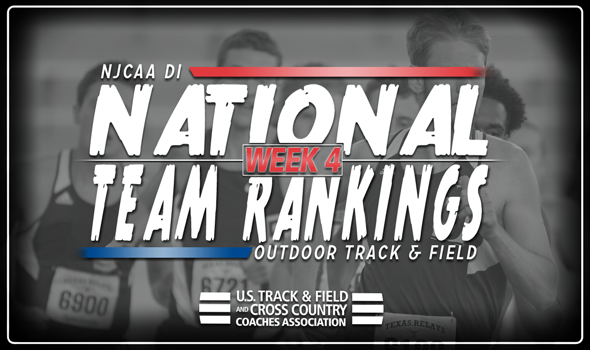 NEW ORLEANS – There was action on the NJCAA Division I outdoor track & field circuit this past weekend, but it did not greatly affect the newest round of National Team Rankings, announced the U.S. Track & Field and Cross Country Coaches Association (USTFCCCA) on Wednesday. Central Arizona did supplant New Mexico JC for the top spot in the women’s rankings, but the remainder of the top-10 stayed in place from a week ago. On the men’s side, the top-six teams held their ground from last week’s rankings. South Plains (Texas) remains the team to beat in the men’s rankings, as the Texans came in at first for the fourth-straight week. Mason Weh led the Texans this past weekend at the West Texas A&M Invitational, where he notched a 13.61 (converted to 13.65 for altitude) in the 110 hurdles, putting him in second on the NJCAA Division I Descending Order List. Barton (Kan.) CC competed at the John Jacobs Invitational where the team notched one top-20 NJCAA Division I Descending Order List mark. That was good enough to keep the squad in second in the rankings. Iowa Central CC, Cloud County (Kan.) CC and Central Arizona rounded out the top-five. Central Arizona moved into first place for the first time since week one of the 2017 season after a big weekend at the Bryan Clay Invitational. The Vaqueros hit five top-10 NJCAA Division I Descending Order List marks at the competition, including the second-best marks in the 400 hurdles by Nicolee Foster, 4×400 relay and the heptathlon by Regina Yeboah. New Mexico JC also had a strong weekend, but still fell one spot in the rankings. The Thunderbirds dominated the 200 at the West Texas A&M Invitational, where D’Jai Baker, Shian Hyde and Raheema Westfall notched the second, third and fifth-best times in NJCAA Division I this year, respectively. South Plains (Texas), Iowa Central CC and Barton (Kan.) CC sat in third, fourth and fifth, respectively, once again.